Ingredients for the salami: 300 grams of flour, 300 grams sugar , six egg yolks, the juice and peel of half lemon, 75 grms of baking powder. Ingredients for the filling: 200 grams alchermes liquor, 150 grams of cocoa powder, half glass of milk, 400 grams of yellow cream. Beat the egg yolks together with the sugar, add the flour, the juice and peel of the lemon, and mix in well. Add the yeast and mix it in well. Smear with butter a narrow and long oven pan, then pour the mix in to reach a thickness of half centimeter. Heat the oven at 180 Celsius, then set the mix in for a few minutes. Using a clean kitchen towel dampened with water, remove the cooked layer of sponge cake from the oven pan. Spread the wet towel on it, then flip the oven pan. Set it on a kneading surface and dampen it with alchermes (in substitution you can use cherry syrup mixed with vodka. Do some tests for consistency and alcoholic content prior to using it), then spread a layer of chocolate melted in milk, and one layer of cream. 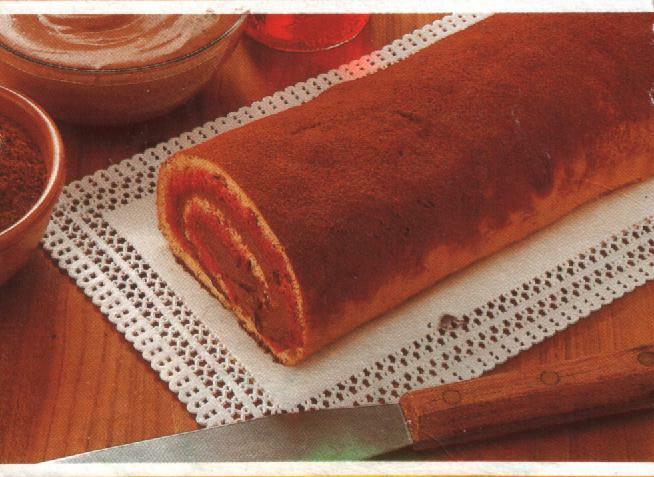 Roll the sponge cake to create a tight sweet salami. Perfect for all seasons, this Umbria recipe is best accompanied by a sweet wine or black tea in winter time.